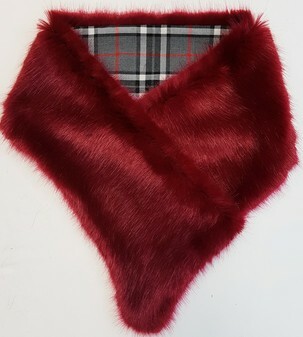 Our tartan and faux fur asymmetric scarves are a great feature piece for your winter outfits. 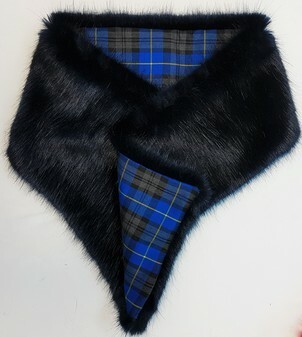 As they are reversible they can be worn in two ways; with the fur at the front or behind - there will always be tartan on show! Asymmetric scarves measure approx 28 cm tapering to 21cm and 102cm long (11, 8½ x 40 inches long). All the scarves below are the same size we've shown them worn in different ways. If you would like a swatch please find swatches in the menu under Fabric. 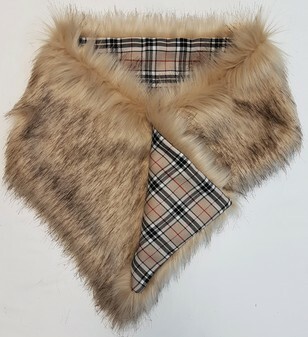 Below are just a few combinations - As we make everything here in our UK studio we are able to create any colour combination you desire and with approx 73 Faux Furs there are over 5,500 combinations to choose from!